some stations will have to be moved surely because of the removal of these crossings. oats street, welshpool and queens park. Well it's good to see a bit of forward thinking for once, I didn't think they'd include Beckenham. My biggest concern now would be passive protection for future quadding of the line, not just for capacity but also for reliabilty and network resilience as when the FAL is extended the Thornlie line will be indirectly connected to the Midland/Fremantle lines. If either the Armadale or Thornlie lines are ever converted to through services operations will become even more complex. ...the situation will worsen with the addition of more services as part of METRONET. It's probably meaningless but I hope this is an indication that there will be an increase in services on the TCL after opening. Currently the project outlines only mention 4 tph until at least 2030, which is shithouse. I really don't think it's possible for it to be anything else but elevated rail north of Cannington, especially if the goal is to connect and revitalise the community. Even disregarding the constraints around Cannington, extensive experience of Melbourne's trench stations suggests that a trenched Armadale line would create a rather hostile public environment. I don't think I'd want to visit a sub-surface Welshpool station. Also it'll be interesting to see what happens at Beckenham, it might be simpler to just build a new concourse and road bridge over the existing station site and re-align the platforms. In that situation the quad-track section could be exrended to the station to make an interchange, which would help avoid delays to Thornlie/Cockburn trains which sometimes get held up waiting for Armadale trains at Beckenham. Whatever they decide, I hope they build it concurrently with the TCL. There has been a large amount of shutdowns in Melbourne for their Level Crossing Removal Project, so to open that line and then potentially have shutdowns would be disastrous for trying to establish it. Yeah, I've got a feeling it will happen by stealth. Wouldn't take much in the future to have the tunnel entrance go under roughly where it will start to turn to head up towards Murdoch Drive. Would have to start doing at least the part from Stock Road through to Stirling Highway first as a "traffic bypass measure" for the ports. So they remove one set of lights and replace it with two!! You do know that it's going to be a grade-separated interchange there, right? It's normal for an interchange to have two signals at close proximity - unless if you're talking about a SPUI, a free-flow interchange or an unsignalised roundabout interchange like they're doing on Northlink. Even though if there are two signals, they will often be controlled by a single system and thus coordinated with each other - just like the signals you have on the diamond interchanges on Mitchell Fwy, as an example. Two signals don't mean that there'd be twice the delay. The government have decided to prioritise Wanneroo Rd over the joining roads in this and the adjacent projects (presumably for political reasons; despite Ocean Reef Rd being slightly busier than Wanneroo in this project). So Wanneroo Rd becomes free-flowing, while Ocean Reef Rd keeps its traffic signals. The new signals should be linked, so overall it shouldn't take any longer to get through the intersection, especially as the straight through Wanneroo traffic will be gone over(/under) the bridge. This (and the other Wanneroo Rd jobs) were hastily thrown together when the Roe 8 cash came free, as Main Roads had some concept designs put together from the 90s. The design they have gone with here deals the best with the land that the government owns (the NE and the SW quads), however it is hardly an ideal design for this interchange. It is frustrating because if you look at the aerial image there is clearly space for a more traditional interchange to be constructed. You would be surprised. Everything being built on the Murdoch Drive connection site is constrained, with every bridge opening as narrow as possible, every abutment as narrow as possible, and the noise walls coming right into the roadside on the approach to the west side. Grades would be fine, but the entire west side of the interchange (and some of the east) would need reconstruction, as well as being able to operate during the "proposed" future works. There are a couple of extra turn capabilities being allowed for should the client so choose, but they are very passive elements thus far. There is the space, alas, they are going ahead with the land they (MRWA) already own, instead of buying up some more properties. The empty lot in the SE quadrant is privately owned, as is the caravan park in the NW quadrant. The design of a better interchange is further complicated as MRWA wants the access to Wanneroo Rd from Woodvale Dr and Villanova St (the nearest side roads north and south of Ocean Reef Rd) to remain. It wouldn't be impossible to keep these accesses open with a diamond interchange, but it would be a lot easier if they could just be blocked off. Yeah, might have to be done as a tunnel coming from a separate bridge between the current proposed and old bridges and feeding on/off onto the existing highway from there. Maybe even a couple of feeder tunnels for traffic coming to/from Kwinana Freeway, though that might add some additional unwanted complexity. Really depends how much room they have to play with. 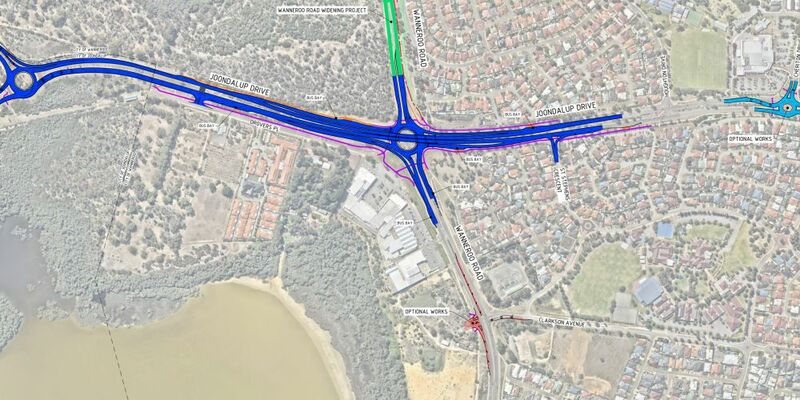 Im not sure if you are including the Joondalup Dr / Wanneroo Rd interchange as one of the adjacent projects but as part of that job Joondalup Dr is being raised and will be free flowing over Wanneroo Rd with the at grade intersection on Wanneroo Rd being converted to a roundabout below the bridge. I didn't realise that Joondalup Dr will be free-flowing over Wanneroo Rd. I must admit I haven't paid too much attention to that project, other than it starting very soon after the intersection had just finished being upgraded as a part of the last Mitchell Fwy extension. Rumour has it Laings have won the north lake bridge project. If so delusional, stupid and incompetent government considering only a month ago Laings had their builders suspended in Queensland due to finance issues. Pretty controversial if you ask me because they have just upgraded that intersection a few years ago as part of an election promise -- ignoring the fact of course that the intersection is planned to be grade separated by MRWA in the near future anyway. I still feel a bit funny with Joondalup going over as opposed to Wanneroo, but traffic volumes as well as demand attraction might actually justify that logic -- given you've got Joondalup city centre on the west side of Joondalup Lake (big employment centre) and the residential developments (Carramar, Tapping, Banksia Grove) on the east. If Joondalup Dr will still connect to Neaves Rd (which is soon connected to Northlink AND the possible Whiteman-Yanchep Hwy) then from a planning perspective it might make more sense to do it this way. Having a quick look at the traffic volumes, it is pretty well justified at the moment. Joondalup Dr has ~43,000 vehicles per day vs ~25,000 for Wanneroo Rd. As you mentioned, all the residential developments and road connections to the east definitely add to its case. The Wanneroo/Ocean Reef Rd intersection is a lot closer with Wanneroo Rd having ~40,000 vs ~46,000 for Ocean Reef Rd. How Joondalup/Wanneroo going anyway? Is it worth trekking up to have a look? I think that the major north-south movement would be catered for by the freeway and future Whiteman-Yanchep Highway so Joondalup Drive, being the link between, would need the priority. I think this grade separation was brought forward which is why it started almost immediately after the upgrade ended. Compared with other intersections on the network, the traffic levels do not warrant grade separation yet and it is the same with the Armadale/Nicholson intersection and Ocean Reef/Wanneroo intersection. Any thoughts on the drivers of these? 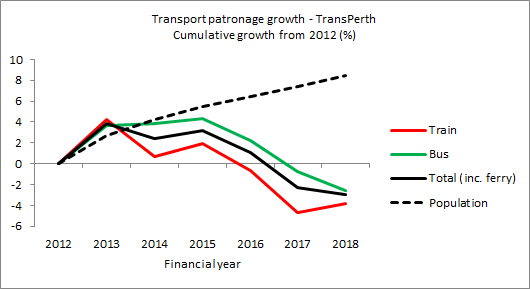 - Train and bus passenger growth both grew strongly up until 2015 but then have started falling, despite continued population growth. Going to guess it's a real economy issue, rather than an urban planning issue like in Melbourne. 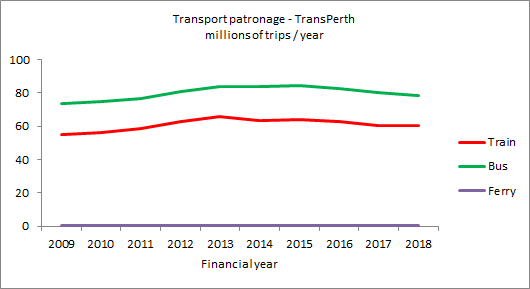 Ferry patronage is growing impressively, but the low numbers means it's too volatile to include on its own. Do you locals think these all look reasonable? Would be better to have the graphs start at around 2000 for a clearer picture. The economy fell in a hole around 2015, mass sackings in city offices eg hundreds at BHP 2014-15 went on around then. 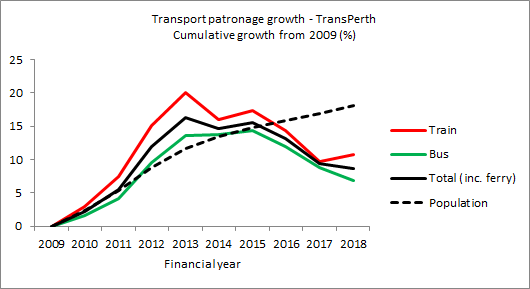 Edit: the peak it's coming off looks clearly related to the economic/mining 'boom', like so many Perth graphs, there is a crazy blip around 2005-2014 that then comes back to normal. Though like I said in another thread tonight, so many people think that blip WAS normal. It's probably because I'm middle aged and remember the pre-batshit crazy times. Last edited by Kelli; April 17th, 2019 at 02:06 PM.